This is What's Trending Today. 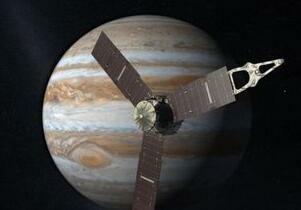 Juno is the name of the spacecraft made by NASA that is now orbiting Jupiter after a five-year journey. NASA recently activated Juno's solar-powered camera to send images of Jupiter back to Earth. NASA posted the first of what is expected to be many images of the solar system's largest planet earlier this week on Facebook. And people have been sharing and liking these photos. Others leave comments on NASA's page about Juno. Chrissa Hanna explained how Juno got its name. It honors the story of Jupiter and Juno in Roman mythology. Jupiter was the most powerful god. He was married to Juno. But he had other lovers: Io, Callisto, Europa, and Ganymede. Those are the names of Jupiter's moons. In Roman mythology, Juno went to investigate Jupiter. Just like what NASA is doing now. NASA thinks Jupiter is the oldest planet in the solar system. One of its goals is to see what lies beneath the swirling clouds that surround Jupiter. And Juno should be able to answer some questions about how Jupiter formed. The first photo shows Jupiter on the left, partly in shadow. Three moons can also be seen. One is Io, another is Europa and the third is Ganymede. The photo was taken 2.7 million miles away from Jupiter. NASA promises better, higher-resolution images on August 27 when the spacecraft moves closer to Jupiter. And that's What's Trending Today. I'm Dan Friedell. In 1957 the Soviet Union launched the first satellite to orbit the earth. We do not know anything except that she was married to a priest and she ran away from that marriage. Saturn is the second biggest planet in the solar system. We all need our gods to be close to what we eat. 1.NASA promises better, higher-resolution images on August 27 when the spacecraft moves closer to Jupiter. When they trained a high-resolution spectrograph on starlight reflected from the planet's moon, they picked up traces of ozone, oxygen, sodium, and nitrogen. 2.NASA recently activated Juno's solar-powered camera to send images of Jupiter back to Earth. Video cameras with night vision can be activated by movement. But how do you effectively reach these people and activate them?